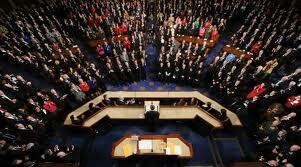 President Barack Obama presented his 2011 State of the Union speech to Congress and the country Tuesday night at 9:00 p.m. Though his words were strong and inspiring, the actions he and Congress take in the coming months will be the true measure of his speech. There was several opposing party members sitting together during the State of the Union speech to show unity and bipartisanship. Though it is a lovely gesture inspired by the recent violence in Arizona, it will mean nothing if government goes back to politics as usual in the coming months. What's more important is that the congressional members actually start working together to do what's best for the country, as stated by the president himself. The key issues to be faced include: reckless government spending, unbalanced systems of financial regulation, job creation in alternative energy production and other fields, plus investment in infrastructure revitalization, public education, and security. Goals addressed in the speech for the political agenda include one million electric vehicles on the road by 2015, and 80 percent of power in America generated by green energy plans by 2035. This is a great idea to get people back to work and investing in a sustainable future. Educational policies were also addressed like replacing no child left behind with a better system, and making the tax credit for college tuition permanent, providing 10,000 dollars over four years. This is no doubt important, but should be smartly debated as to how the programs will be paid for. Job creation and economic issues were the central focus of his speech, and rightly so. Issues such as reckless spending, unemployment, trade deficits, and the increasing national debt are all important issues on the minds of Americans. Even issues that have been very difficult politically were addressed by the president. The president promised that illegal immigration will finally be discussed and tackled by Congress, along with the repeal of Don’t Ask Don’t Tell. The resolution of such large issues completely depends on the willingness of Congress to work together. The approval ratings for Congress have been low for several years according to Gallup polls. There was a shift in power during the last election cycle with voters choosing to get rid of many incumbent members. This needs to serve as a wake-up call to everyone elected and remind them that they are not guaranteed another term if they do not act responsibly.